Large commercial trucks travel through Kansas City and across the nation transporting the goods we use every day. Most arrive at their destination safely; however, accidents happen. Sometimes those large commercial trucks roll over, and when they do surrounding motorists can be seriously injured. According to the FMCSA, over 78% of rollovers involve driver error. What are rollover truck accidents? Rollover truck accidents are just that — a truck accident that results in a large commercial truck rolling over on its side and once a big rig starts to topple, there is no way to control it. 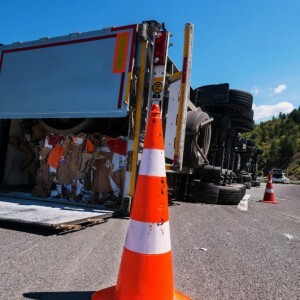 Often, a rollover truck accident can cause chain reaction collisions on the roadway or the cargo may spill out on the road causing additional accidents. Surrounding motorists are at risk of being crushed or trapped underneath. Rollovers can happen at any time, any where. In fact, according to the FMCSA, 56% happen on straight roads, with no curve or ramp in sight. Commercial truck rollovers typically cause severe injuries and fatalities in highway accidents. Accidents involving large commercial trucks are complicated. You need an experienced truck accident attorney who can take this load off your shoulders. Our goal is to help you and your family put your lives back together by obtaining the compensation you deserve. When you need to understand your legal options in a rollover truck accident, you want a trusted and experienced legal team who will fight for your rights. In the Kansas City area and across Missouri, contact the truck accident attorneys at Nash & Franciskato for a free, no-obligation evaluation of your case.